If you’ve read about Babe’s background, you now know he spent most of his own life as a kid – from ages 7 to 19 – at St. Mary’s Industrial School. His life there was very tough and pretty sad at times. It really had a big impact on him. And, he never wanted any kid to have to grow up the way he did. He felt that every child’s life should be full of happy times, fun, and of course, baseball. After he started becoming a famous baseball player, Babe did whatever he could to help kids and make them happy. How did Babe do that? Well, he did that in a lot of ways. Right from the start of Babe’s days of playing baseball, he started helping kids. 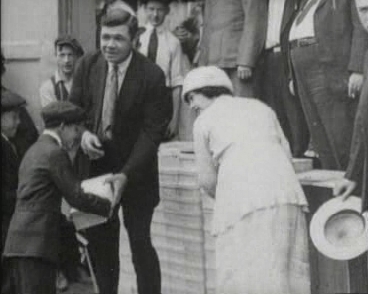 For example, during World War I, times were a little tough in the U.S.A. A lot of kids couldn’t even buy their own shoes. So, Babe bought a bunch of shoes and passed them out to the kids of New York. He also helped the U.S. government promote bonds for the war effort. Even when Babe became more famous for his homerun hitting, he never let a kid down when they asked him for an autograph. After he was done playing a game, Babe used to stand outside the ballpark, sometimes for hours, and sign baseballs for all the kids. Even when the Babe was sick with cancer and staying in the hospital, he still signed autographs on pieces of paper and dropped them down from his hospital window to all the kids below that were calling his name. Better than autographs for some kids, Babe also played a lot of sandlot baseball with kids everywhere he went. He sometimes would play a game with local kids right before or after a big league game. Imagine playing baseball on your local diamond with famous ballplayers of today! Throughout his days, Babe often went to orphanages and hospitals to visit children who were less fortunate. He even went back to St. Mary’s school a few times to visit the kids at the place where he was raised. Probably the most famous story about the Babe and kids is when he visited a sick little boy named Johnny Sylvester in a hospital in St. Louis and promised him a homerun. The next day, the Babe hit two homeruns! In time, Johnny also got better. 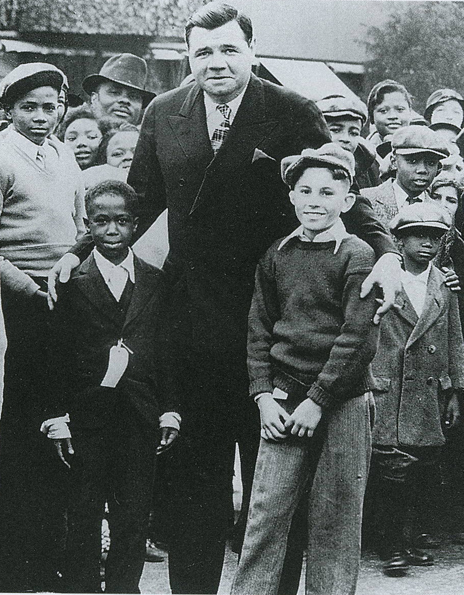 Shortly before Babe Ruth passed away, he had created a foundation called “The Babe Ruth Foundation”, which gave money to poor and needy children. When Babe died, a lot of his money went to this foundation. There is no doubt that the two things Babe loved most in life were baseball and making kids happy.